Mary Mitchell O’Connor and chairperson of the taskforce Marie O’Connor at the launch. 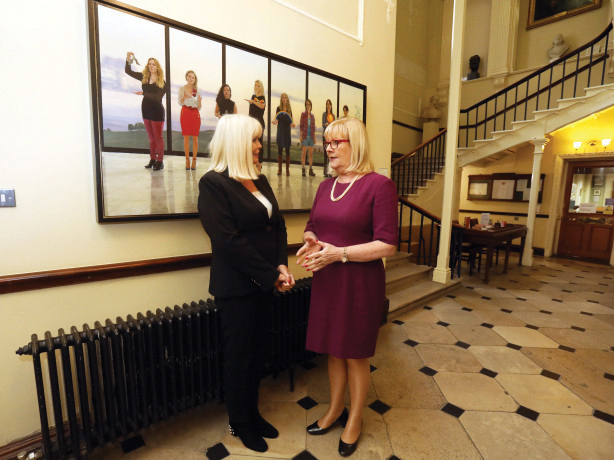 Mary Mitchell O’Connor, Minister of State for Higher Education, who has vowed to eradicate gender discrimination in colleges, launched a new gender taskforce earlier this month. The task force will carry out a review of recruitment and promotion policies in the third-level sector and will prepare a prioritised three-year plan. The government taskforce follows the publication last year of a gender review group by the Higher Education Authority which highlighted issues in relation to transparency in recruitment, promotion, and progress in colleges. The minister said higher education institutions which fail to make progress in relation to gender equality will lose access to research funding. Latest figures from the HEA found that just 21 per cent of professors at the country’s seven universities are women, a clear under-representation. Since the establishment of the first Irish university 425 years ago, there has never been a female president. DCU said it is supportive of initiatives such as the Gender Equality Taskforce which aim to create a culture that supports female staff in pursuing career progression to senior levels within third- level institutions. President of the university, Professor Brian MacCraith said, “Gender imbalance numbers at senior levels within the third-level education sector are unacceptable and this multi-faceted problem must be tackled head-on. “DCU is introducing real cultural changes that create a better, more inclusive, working environment for both women and men,” he said. While some female staff in DCU believe the university is taking proactive measures, many feel there’s more work needed to change the culture and historic imbalances.